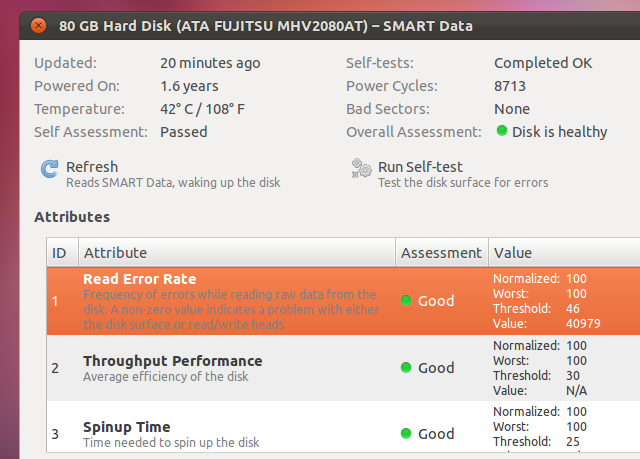 How to Run HDD SMART Tests in Ubuntu Linux? S.M.A.R.T (Self-monitoring analysis and reporting) is a fail safe technology that’s built into newer hard disk drives that has the ability to monitor the drive and give feed-back about its health. On most occasions, it should be able to notify you just before something bad is about to happen (don’t count on it though… taking backups is still the king). This “health check” is performed by the HDD itself by using various read & write methods, spin up/down tests etc. Other than letting the HDD to inform us when something bad is about to happen, there are tools that we can use to perform these tests manually to check for the health of the HDD. 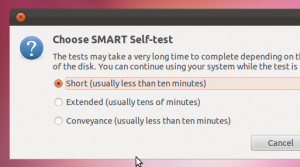 There are few users available in Ubuntu but Ubuntu actually comes with a disk utility (GUI) of its own that we can use to perform these S.M.A.R.T tests with ease. How the heck can I launch that? 1. Simple. Just press “Windows key” (in Unity desktop) and simply put the below text and click on its icon. 2. Or just open your Terminal window (or press ‘Alt’ + ‘F2’) and put the below command and press the Enter key (both methods should work). 3. Then you should see a window a bit similar to the first image shown above. 4. Now, to your left under “Local Storage”, choose your HDD and then to your right-side you’ll see a button called “Smart Data”. 5. 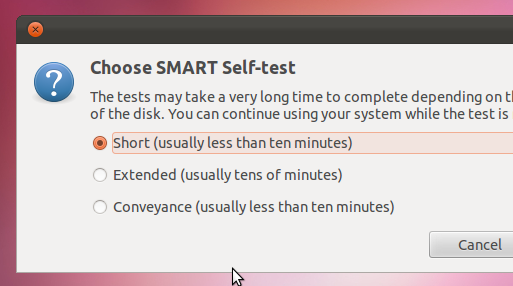 Now click on it and from the next window choose “Run Self Tests”. This will let you perform three types of S.M.A.R.T tests on your HDD. By using this window you can actually see a lot of details of the HDD itself such as its Temperature, whether it passed the last SMART test or not and some individual tests related information. Things are pretty much automatic from here. Just choose your test method and follow the on-screen instructions. Remember, although SMART technology is there to help you but don’t run it quite frequently as it might unnecessarily put some stress on the HDD and shorten its lifespan. If I’m not mistaken, you should be able to use this app in Ubuntu 10.04 & 10.10 (including both 11.10 Oneiric Ocelot and 11.04 of course) without having to manually install it. But for older versions you can install it manually by using the below command. Cross-Platform Color Popping Software – Tintii! Simple (yet Powerful) System Monitor for Ubuntu Linux – Watsup! Thank for pointing that out Chris. I updated the post, I apologize for those complications mate.